I was revisiting my article I wrote for Tournaments Illuminated on the London Masters of Defence, and I got to thinking that a timeline setting the developments in rapier in Europe alongside the developments in rapier in England might be a good idea, it would give people an idea of what types of fencing manuals would be available to an English fencer at different times. For this I was aided by the lists of fencing manuals kept by both ARMA and Jared Kirby. I ignored the manuals that didn’t involve fencing, so that would be any manuals that focused purely on wrestling or horsemanship. What I learned is that the early use of Rapier in England (such as the exhibition matches before Edward VI) would likely have been more like longsword combat utilizing a rapier (or rather what we’d call a sidesword) or would be similar to Manciolino or Marozzo; while the formal teaching of the rapier under the London Masters of Defence (1568 and later) would have been closer to Agrippa and later DiGrassi and Dall’Agocchie. It would be interesting to compare Agrippa and DiGrassi as it would likely show the difference between the teaching of the Rapier for the yeoman class and the gentleman class. 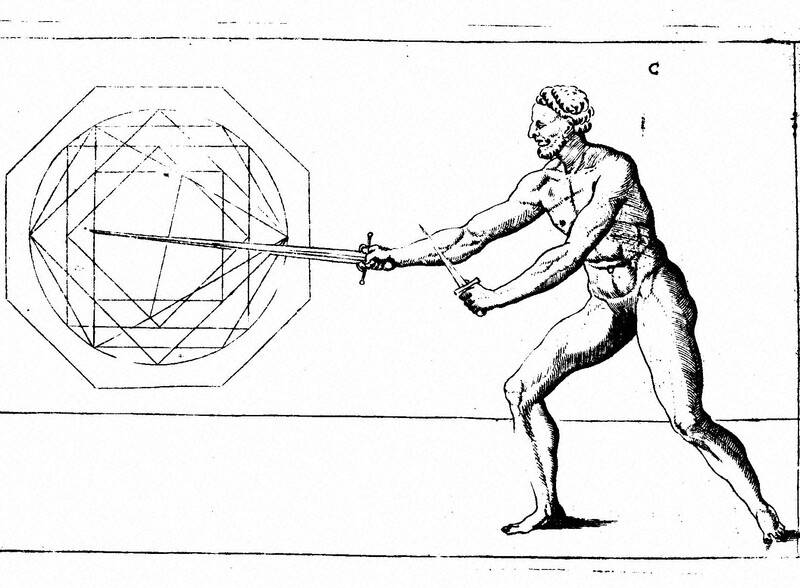 The yeoman class would likely still be using modified longsword techniques as well as Agrippa and Marozzo while the gentry, being taught by Bonetti and other Italian fencing masters, would have been using the newer techniques from DiGrassi and Dall’Agocchie earlier. By the time Silver is complaining about the use of the rapier in England the manuals of choice were likely from the later manuals such as DiGrassi, Meyer, de Sainct Didier, Dall’Agocchie, Viggiani, Ghisliero, Lovino, and perhaps even Carranza, in addition of course to Saviolo. Swetnam’s teaching however would likely have been closer to Fabris’ manual than even Saviolo’s work. This is part of an ongoing project to summarize and provide SCA focused commentary on The Schoole of the Noble and Worthy Science of Defence by Joseph Swetnam, published in 1617. For links to the other sections of the Swetnam Project please go here. I am using this facsimile: http://tysonwright.com/sword/SwetnamSchooleOfDefence.pdf for the project. Here is the third part of this section in Chapter 12. The manners of a passage. When making a passing lunge (Swetnam calls this a passage) you must be fast, nimble, and focused. It is a dangerous attack as it brings you very close to your opponents weapon, and is more dangerous the more skilled your opponent is. To counteract the innate danger in this lunge you must be skillful, have practiced, and have good judgement, especially in knowing where your opponents weapon is. You must make your passing lunge as fast as possible, as soon as you see an opening with your opponents sword high you need to step forward with your left foot quickly, and parry your opponents weapon with your dagger, pushing it up and out of the way at the same time that you attack with your rapier. Your parry and attack must happen at the same time rather than as two actions or it will be too slow. The passing lunge is most effective if your opponent likes to stay in the same guard, but is more dangerous if he moves from guard to guard frequently. We just finished covering stance/guard and a few basic parries. Now we move on to the next part of this section. I’m not sure why this section of chapter 12 is so long. Three mannor of waies for the holding of a Rapier. Swetnam tells us that there are three ways to hold a rapier. With the whole hand in the pummell, I believe he means on the grip of the rapier, with the thumb locking on the forefinger. Gripping the pommel (button of the pummell) with your fingers and palm while your index and thumb are on the grip. The true guard for the defence, either of blowe, or thrust, with Rapier and Dagger, or Sword and Dagger. Keep your rapier hand inline with the pocket of your hose, without bending the elbow, while your dagger hand should be inline with your left cheek, with your arm outstretched (not bowing the elbow), and with your rapier and dagger points within two or three inches of each other. Make sure that you can see your opponent clearly, and that your left arm is high enough not to obscure your view – you should be able to see your opponent with both eyes. Keep your opponent centered between your rapier and dagger. Have your head angled slightly toward the right shoulder, and have your shoulders square to your opponent, slightly tilted forward. Keep your thumb on the nail of your fore finger, rather than upon the blade of your weapon (which was the current fashion) so that you have a more secure grip upon your sword. The heel of your right foot should be in line with where your toes meet your foot. Use the picture as an example, but if there is a discrepancy follow the words, not the picture. We have now reached the combat portion of the manual. There is a major change here in that the rest of the book is part of chapter 12. The table of contents has broken it down into 18 sections. I will be using the sections as they are listed, but as with the previous chapters still using each inline heading as the heading for the post. I may need to go back through and add more sections if my posts prove too long, but I’ll cross that bridge when I burn it. Chap. XII. Sheweth of seauen Principall rules whereon true defence is grounded.